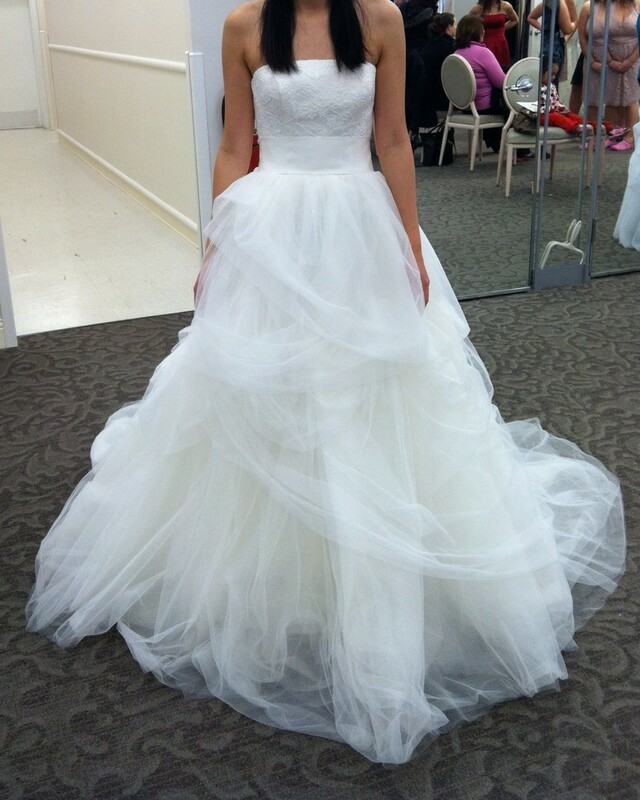 I did my wedding dress shopping all the way back in January! It was the very first wedding appointment I made, for David's Bridal on 1/5/14. It's because I already knew which dress I wanted, for almost 2 years. 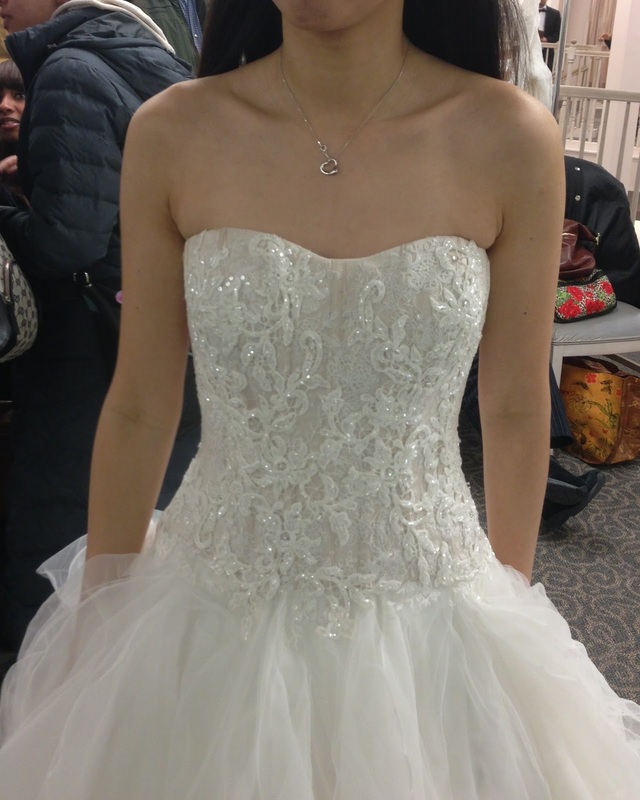 Ever since my sister went bridal dress shopping in 2011, I had my eyes set on a dress my sister also liked. Plus another unique dress she tried on that I started becoming more open minded to. My sister did not choose either of those dresses because of her short and petite frame, and that lead me to constantly considering these 2 dresses for the past 2 years. Now that its 2014, with a proposed wedding date of May 2015, I am ready to try them on! I tried on the unique dress first and......it's the one!!!! I'm not going to spoil it and show pictures, but I just want to say, I love it so much. I always thought i'd go with a traditional ballgown/a-line-ish style dress that is simple and glamorous. But instead, I've gained an interested in ruffles, soft chiffon, and a romantic look. I also didn't think I want that modern mermaid style, but I've found that it flatters my figure, so a dress that is a little form fitting won't hurt. 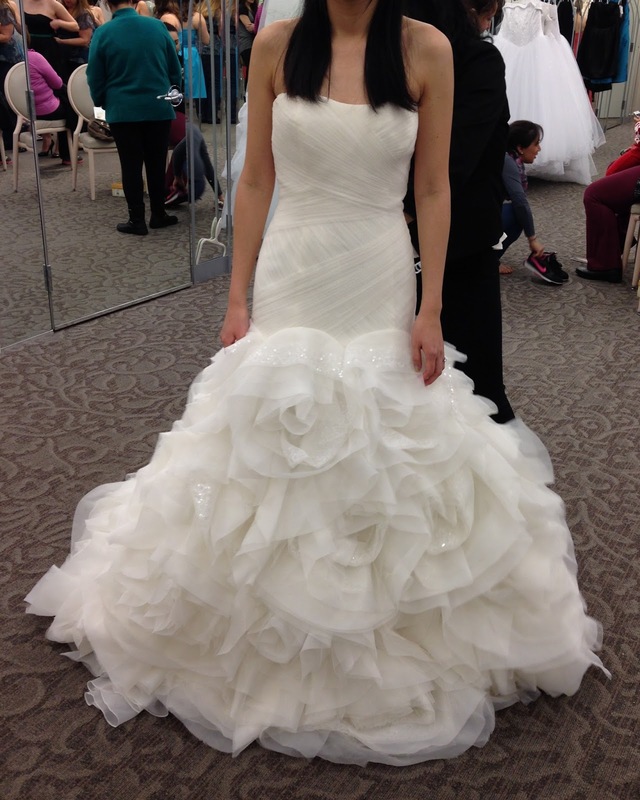 I'll share a few of the fun dresses I tried on at Davids Bridal. I also went to RK Bridal in New York, but they don't allow pictures. 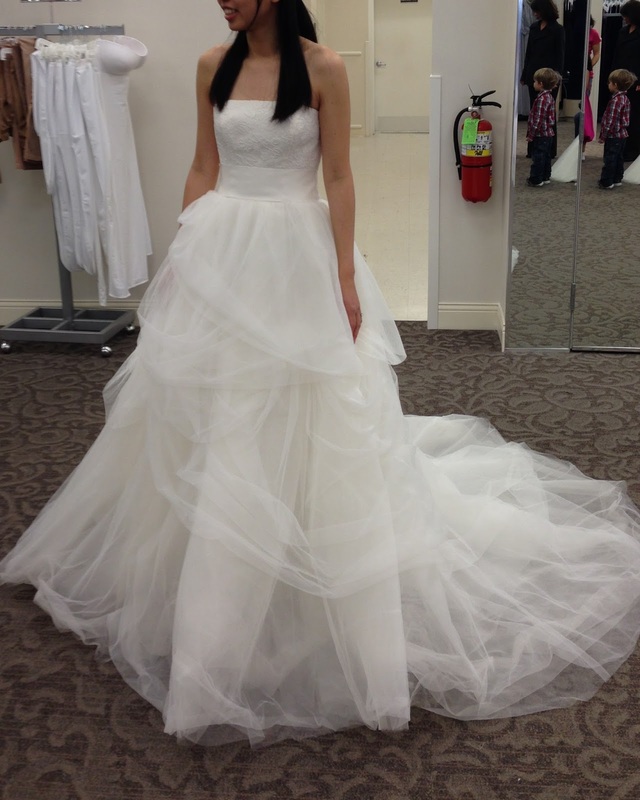 Other than the White by Vera Wang collection, I wasn't too interested in any of the David's Bridal lines. I did like the style of the Melissa Sweet line, but just didn't find one I liked on me. This was my original first choice. 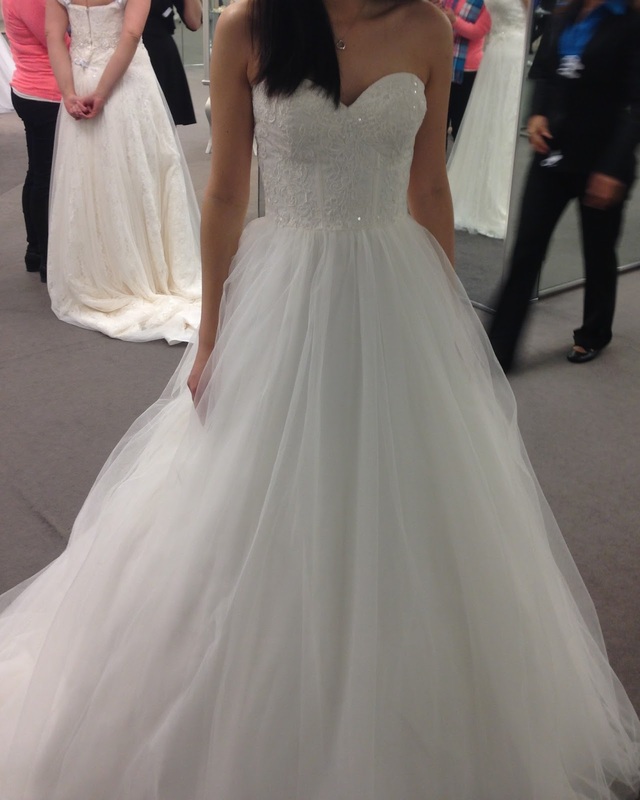 The second dress I tried on. It has that traditional shape of a simple lace strapless top, and a poofy ballgown shape bottom. But unique in that there are layers of chiffon pick-ups. Very very soft and romantic. It looked a lot better in pictures then when worn. It takes some effort to make the gown fall nicely and in place. So it can look a bit messy as it does below. I still like it, but it didn't wow anyone. 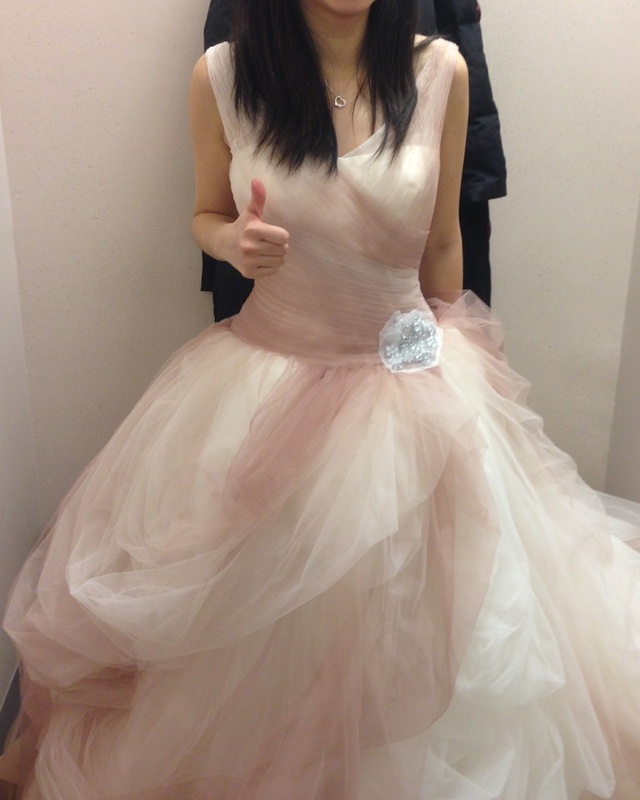 Tried on the typical princess ballgown. The size was really big, but even so, it engulfs my small frame. Made me look wide. Too much fit and flare, crisscrossing, and sequins in the ruffles. Melissa Sweet. Pretty, but not for my wedding dress. Too much mermaid for me, and the top and the bottom half are too contrasting. Slim lace into abrupt smooth layers. Went back for my second appointment to buy my dress, but had some fun trying on a few more styles. I saw this on the mannequin and thought it was pretty but didn't think much of it since it's a corset. I actually really loved the fit of it when I tried it on. I felt slim and beautiful. This would have been the type of dress I wanted as far as ball gown and ruffles go. 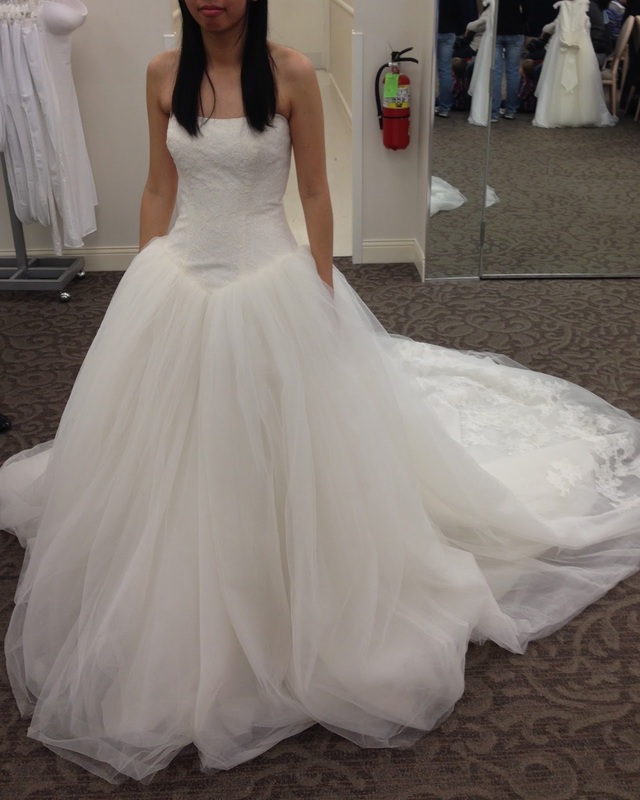 I think it would have been a strong contender if I didn't have my heart set on the other dress for so long. I hope I made the right choice! Just kidding!!! haha. No offense, but the ombre, random ruffles are just not my thing. I bought my dress that day, at the end of January. I wanted to take my time, but it was on sale for $50 off, plus an additional $50 coupon I received that expired at the end of the month. I didn't think it would get any cheaper, or risk the dress being discontinued, so I bought it. (Unfortunately it is $200 cheaper right now. But better safe than sorry!). I can't wait to reveal my dress on my wedding day! I must also take this moment to say that I DID like all of the dresses tried on, but this particular purchase involved more than sensibility and logic. It involved YEARS of girlie imagining, fashion perusing and the heart of "Uptown Red Head!"